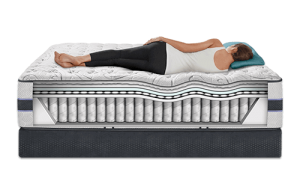 iComfort Hybrid HB300Q SmartSupport Cushion Firm at Mattress King | Mattresses, Mattress Sets, Adjustable Beds, Memory Foam and more! Serta, Beautyrest and A.H. Beard mattresses. Serving Sterling Heights, Lake Orion, Fort Gratiot, Chesterfield, Richmond, Lapeer and surrounding areas. Call for a free quote today! 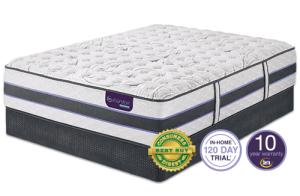 For a feeling of unmatched responsive cradling that follows your body’s every move, our all-new iComfort SmartSupport™ Hybrid beds combine our exclusive EverFeel® Triple Effects™ Gel Memory Foam with our new SmartSupport™ Memory Coil System – the world’s first system that offers support with the unique feel and response of memory foam. Your body gets the individualized support it needs from our most advanced Duet® Elite Individually Wrapped Coil Support System. 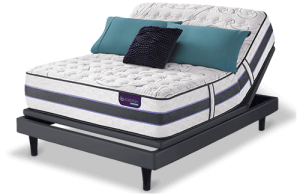 The HB300Q model offers the familiar look and feel of a traditional “cushion firm” mattress.